What are IMCI and iCCM? Integrated Management of Childhood Illness (IMCI)—introduced by WHO and Unicef in the mid-1990s, aims to reduce death, illness, and disability and to promote improved growth and development among children under 5. IMCI includes both preventive and curative elements that are implemented by families and communities as well as by health facilities. The strategy includes three main components: improving case management skills of healthcare staff; strengthening health systems; and improving family and community health practices. Integrated Community Case Management (iCCM)—introduced by Unicef and WHO in 2012 as an equity focused strategy to complement and extend the reach of public health services by providing timely and effective treatment of common illnesses to populations with limited access to facility based healthcare providers and especially to children under 5. Under iCCM, frontline workers in the community are trained, supplied, and supervised to diagnose and treat malaria, pneumonia, and diarrhoea in children with an integrated approach using artemisinin based combination therapies, oral antibiotics, oral rehydration salts, and zinc. The 2016 strategic review of IMCI and iCCM assessed the past two decades of implementation and drew lessons for meeting future child health goals, including those related to equitable outcomes, under the UN’s sustainable development goals and the Global Strategy for Women’s, Children’s and Adolescents’ Health (2016-30).4 It drew on qualitative and quantitative data sources from over 90 countries, hundreds of experts in global child health, and reviews of the scientific literature.5 Based on this review, we assess the contribution of IMCI and iCCM to reducing child health inequities, focusing on wealth and place of residence, and discuss ways to promote equitable child health outcomes in future strategies. We also analyse data from Demographic and Health Surveys (DHS), the global IMCI and iCCM implementation survey, and other sources (see supplementary materials). We tested the association between implementation of these strategies and reduction in wealth based inequities in care seeking for children with pneumonia or with any disease, using repeated panel analyses of DHS data (1993-2014) and IMCI and iCCM implementation data from a 2016 global survey from WHO and Unicef.15 We analysed IMCI and iCCM separately, as they were often implemented separately and over different time periods. 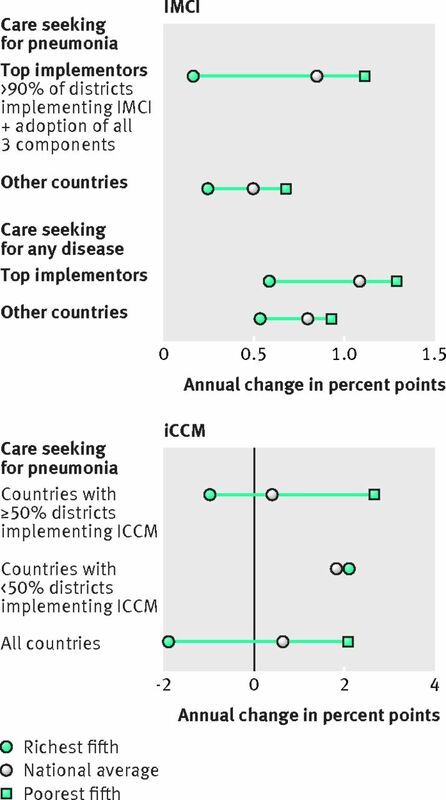 The “top implementers” of IMCI (countries with >90% of districts implementing all three components) had notably faster annual increases in care seeking for pneumonia or for any disease, both as a national average and as a relative rise in the poorest fifth (fig 1) (based on 90-147 surveys in 31-48 countries; see supplementary materials). Because IMCI is a system-wide intervention with often partial implementation, fuller implementation to reach all children might have resulted in even greater increases in the poorest countries. IMCI and iCCM implementation and annual percentage point increase in care seeking by wealth. Based on data from Demographic and Health Surveys (DHS) and the IMCI implementation survey. The analysis for IMCI is based on 90-147 surveys in 31-48 countries (1994-2010). The analysis for iCCM is based on 24-27 surveys in 18-22 countries (2010-14). For more detail on how these analyses were produced, see supplementary materials. iCCM is a more recent strategy, implemented widely in sub-Saharan Africa beginning around 2010 and aiming to extend case management to underserved populations. Its effect on equity has been mixed (fig 1): countries with greater implementation (≥50% of districts implementing versus <50% of districts) had slower average annual growth in care seeking for pneumonia (0.4% point annual change versus 1.9%), slightly faster increases among the poorest fifth (2.7% point annual change versus 2.1%), and a notably greater spread across all countries (not enough DHS surveys were available to calculate care seeking for any disease; see supplementary materials). The contribution of iCCM to reducing inequities is complicated by the strategy’s recent advent and the lack of detailed data about the extent of district implementation. The greater benefit in the poorest fifth of higher implementing countries could be a result of the strategy’s focus on underserved children. Both IMCI and iCCM seem to facilitate reductions in wealth based inequities in care seeking for childhood illness, but we think that emphasis on equity in strategy design and implementation could have led to greater improvements. We identified several blind spots in the design and implementation of these strategies that should be tackled to ensure maximal impact on inequities. Global policy makers should prioritise intersectoral interventions, provide support for implementation, and articulate to national decision makers how these are complementary to IMCI and iCCM. WHO’s Health in All Policies framework, based on the notion that action in all sectors is required to improve the health of the poorest, is relevant but requires strong government ownership of child health goals and systematic coordination between sectors.23 In Peru, for example, government leadership and political will led to a move away from vertical programmes with an exclusive emphasis on maternal and child health, a decision that was key to the country’s success in reducing under 5 mortality.2124 Global and national stakeholders should boost political advocacy while also providing coordinated guidance and support for intersectoral activities, in line with the focus on children’s healthy development and the relation between health and all 17 of the UN’s sustainable development goals. Many health systems were underdeveloped when IMCI was introduced, and many countries selected districts for implementation based on feasibility rather than need. IMCI was implemented to a lesser extent in poorer or more remote districts in Peru and Tanzania, for example, often owing to poorer health systems in those areas. In Brazil, IMCI was less implemented in municipalities with low per capita income and small populations or those that were far from the state capital.10 iCCM brought case management services to more underserved areas from 2010, but the objective of improving population coverage of effective treatment interventions was not often achieved.14 Persistent geographic differences in coverage and health outcomes reflect an “urban bias” in service provision but can also result from longstanding neglect of poor populations, ethnic minorities, and indigenous populations. Coverage of child health services is often incongruent with population needs. Stakeholders in Ethiopia, Nepal, and Yemen said that planning for IMCI implementation was not explicitly equity focused, resulting in a failure to target areas where mortality was higher and intervention coverage was lower. Many countries failed to coordinate activities between governmental and non-governmental actors and to target resources to areas of need. Maps of under 5 mortality in Ethiopia show regions in clear need of intervention, but health extension workers are not necessarily more numerous in these areas (fig 2). Ethiopia’s ministry was more successful in coordinating coverage than many other surveyed countries, but maps still show some areas served by multiple organisations and some by one (or none). Mapping of child health needs and resource allocation in Ethiopia. Infant mortality was calculated from 2011 Demographic Health Survey (DHS) data and represents 10 year rates. Health extension worker and implementing partner data were collected as part of the strategic review and represent services in 2016. More details available in supplementary materials. IRC=International Rescue Committee; SCI=Save the Children International; MOH= ministry of health; STCF=Save the Children, Finland; IFHP=Integrated Family Health Program; JSI/L10K=John Snow Inc/Last 10 Kilometres Project. Insufficient funding of child health programming is a cause of substandard public services, with the resulting burden of inferior care and out of pocket expenses falling disproportionately on poor families. The largest equity gaps affect interventions that require 24 hour access to health facilities.1 Elimination or reduction of user fees for child health services, recommended by WHO and shown to promote equitable outcomes by increasing service use most among the poorest,2930 is still not in force in many settings. In other contexts, elimination of service fees has not been conducive to the provision of high quality health services, because implementing the reform without preparing alternative funding mechanisms can increase access at the expense of quality. Problems with sustainable financing are caused by more than just a lack of available funds. For the past two decades, the failure of partners to coordinate efforts globally and within countries was, in the words of one interviewed stakeholder, “inexcusable,” resulting in lopsided implementation, with some policy components and geographic areas receiving disproportionate resources and others going without. The Global Financing Facility—a World Bank initiative to coordinate resources from grants, governments, and private sources, bringing complementarity to partners’ support for maternal and child health—should be closely monitored for its effect on equity. Lack of coordinated funding by global partners was compounded by insufficient allocation of funds. In the IMCI global survey, 60% of countries (55/85) cited the lack of a dedicated budget line in the health sector plan as a major barrier to implementation. “Cost of the programme” and “budget for training” were also cited as barriers at the regional level in 55% of countries (50/91) and 82% of countries (75/91), respectively. Meanwhile, only a minority of countries report plans to increase the proportion of funding for iCCM from domestic resources,31 possibly as these are often viewed as a “donor owned” strategies, with community health workers not being perceived as formal members of the health system. Equity oriented policies focus on the disproportionate burden of ill health among disadvantaged groups; on geographic, financial, and psychosocial barriers to access to services; and on remedial measures both inside and outside the health system.36 Many tools already exist: poverty reduction programmes and other intersectoral means of tackling social determinants of child health; geographic information systems and similar analytic tools to ensure equitable service delivery; and improved financing models. These approaches should be incorporated into IMCI and iCCM in coherent, complementary ways to maximise their equity promoting effects. Better data on health outcomes stratified by equity variables is sorely needed. Structured, comparative evaluations of programmes’ effects on health equity should be prioritised3738 so that national stakeholders can redress gaps in coverage, access, and outcomes, especially for the most vulnerable children. To support such policies, countries need more resources. This will require government ownership and political will, to be spurred as necessary by well funded advocacy efforts. In our research, some countries reported advocacy or lobbying activities aimed at government, civil society, and industry (box 2), but we need to understand how to better engage these stakeholders. Many stakeholders interviewed for our research also said that IMCI could be transformed from a strategy to a programme, to encourage greater state financing and sustainable donor commitments. In any case, strong country planning must be backed by much more effective global coordination of resources, as has too rarely been the case over the past two decades. Equity oriented child health policies fulfil a basic human right; they are also cost effective, improve coverage faster, and result in greater gains in child health indicators. In the upcoming WHO and UNICEF initiative to redesign child health guidance and in implementing child health strategies worldwide, stakeholders should focus on ensuring equitable delivery of sustainably financed intersectoral services—with leadership and accountability to make it happen. We thank the many contributors to the research underpinning the Strategic Review, as well as Aluisio Barros and Cynthia Boschi-Pinto for their work preparing the analyses underpinning the analysis of IMCI and iCCM implementation and annual percentage-point increase in care-seeking by wealth quintile. Contributors and sources: This article is based on findings from a global review of Integrated Management of Childhood Illness (IMCI) and integrated Community Case Management (iCCM) commissioned by the World Health Organisation. SLD conceived the outline of this paper and wrote the first draft; CGV, FCW, and GL performed the statistical analyses underpinning figure 1, and EDR performed the statistical analyses underpinning figure 2. All authors contributed intellectual content, edited the manuscript, and approved the final version for submission. Funding: The strategic review of IMCI and iCCM was funded by the Bill and Melinda Gates Foundation; the authors donated their time to writing the article; the publication fees for the supplement were funded by the Health Systems Research Unit, South African Medical Research Council. Competing interests: All authors have completed the Unified Competing Interest form. We have read and understood BMJ policy on declaration of interests and declare no conflicts of interest. The authors alone are responsible for the views expressed in this article, which does not necessarily represent the views, decisions, or policies of the institutions with which the authors are affiliated. Provenance and peer review: This article is part of a series based on findings from a global review of Integrated Management of Childhood Illness funded by the Bill and Melinda Gates Foundation. Open access fees were funded by the Health Systems Research Unit, South African Medical Research Council. The BMJ peer reviewed, edited, and made the decision to publish the article with no involvement from the Medical Research Council. Countdown to 2015. A decade of tracking progress for maternal, newborn and child survival: the 2015 report. Geneva: WHO 2015. http://www.countdown2015mnch.org/documents/2015Report/Countdown_to_2015_final_report.pdf.
. Methods for the strategic review of programmes for integrated management of childhood illness and community cases. BMJ2018;362: k2989. World Health Organization. Handbook on health inequity monitoring with a special focus on low- and middle-income countries. Geneva: WHO, 2013. http://apps.who.int/iris/bitstream/10665/85345/1/9789241548632_eng.pdf. Unicef. Narrowing the gaps: the power of investing in the poorest children. New York: Unicef, 2017. https://www.unicef.org/publications/files/UNICEF_The_power_of_investing_in_the_poorest_children.pdf.
. Global implementation survey of Integrated Management of Childhood Illness (IMCI)—twenty years on. BMJ Open2018;8:e019079.
. Maternal mortality in Bangladesh: a Countdown to 2015 country case study. Lancet2014;384:1366-74. 22Clark J. Medicalization of global health 1: has the global health agenda become too medicalized?Global Health Action2014;7:23998.
. Integrated Management of Childhood Illness (IMCI) in the 21st Century: Present situational analysis, integration into health systems and innovations.Unicef, 2016. United States Agency for International Development, Maternal and Child Health Integrated Program. Considerations for incorporating health equity into project designs: a guide for community-oriented maternal, neonatal, and child health projects. Washington, DC: USAID, 2011. http://www.mchip.net/sites/default/files/Equity%20guidance_090111_formatted_final.pdf.
. Public health agencies and cash transfer programmes: making the case for greater involvement. Social determinants of health discussion.WHO, 2011.
. Child Health in Rural Mexico: Has Progresa Reduced Children’s Morbidity Risks?Soc Policy Adm2006;40:652-77doi:10.1111/j.1467-9515.2006.00525.x .
. Cash transfers: what does the evidence say? A rigorous review of programme impact and of the role of design and implementation features.ODI, 2016, https://www.odi.org/sites/odi.org.uk/files/resource-documents/10749.pdf.
. World health report: primary health care (now more than ever).WHO, 2008.
. Strengthening the capabilities of families and communities to improve child health in low and middle income countries.BMJ2018;362:k2649.